Two weeks, eight teams and a total of 184 players from 14 nations. The World Cup of Hockey 2016 was truly a best-on-best tournament, which provided a stage for hockey’s elite to showcase their skill, speed and talent as they competed for global hockey supremacy. From puck-drop in the first pre-tournament game back on Sept. 8 in Finland to the final buzzer sounding to end last night’s game in Toronto, fans far and wide have witnessed the game’s best players display a consistently high level of hockey. “We tried our best to get the best players in the world on the ice in one tournament and I think we did that,” said Team Canada forward Steven Stamkos. The World Cup of Hockey was certainly not short on storylines. During the pre-tournament and into the first round of the tournament itself, Team North America’s exciting style of play was unquestionably the focus among those around the game. Team Sweden and Team Russia played themselves into the semi-finals before running of steam against their formidable opponents. As the tournament progressed, Team Europe progressively garnered more attention with its effective and successful approach that took them to within minutes of forcing a third and deciding game in the Final. When it was all said and done, however, Team Canada would not be denied a championship. 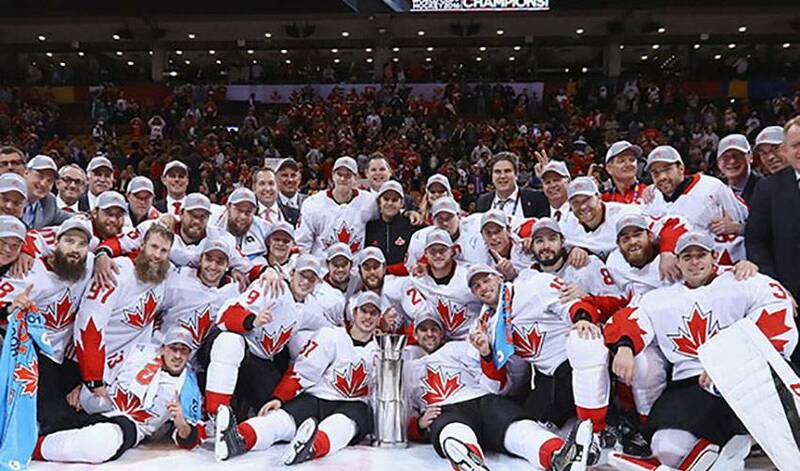 A sure favourite to win entering the tournament, Team Canada wound up hoisting the trophy on Thursday night in Toronto. After winning Game 1 of the Final 3-1 on Tuesday, Team Canada knew they would get Team Europe’s best performance on Thursday evening to avoid elimination. While Team Europe led 1-0 late into the game behind another outstanding performance from Jaroslav Halak, late heroics for Team Canada from forwards Brad Marchand and Patrice Bergeron gave the Canadian entry two late goals that allowed them to seal their 2-1 victory and go undefeated in the tournament. This was a team that had all of the puzzle pieces in place and always found a way to get the job done. “There’s a lot of players that have championships and know what it takes to win,” Team Canada Goaltender Carey Price said. “We just kept pounding and grinding and found a way to do it”. Two teams with extremely high expectations heading into the tournament would end up starting 0-2, which cut their World Cup aspirations short. Both Team USA and Team Finland, who many would argue were top contenders heading into the tournament, were surprisingly not able to get a win out of their three group games. Although the results were unexpected, it further illustrates how competitive the hockey was in Toronto. The two new specialty teams wasted no time creating headlines day after day. Team North America lived up to the hype, showcasing their high level of skill and speed from their under-24 group, and won over throws of fans. Despite their elimination ahead of the semi-final round, Team North America left a lasting impression in this tournament. Every time they stepped on the ice, the ACC was electric. Social media was exploding with the same speed, enthusiasm and passion towards the “kids” that they displayed night after night. Team Europe’s roster consisted of 23 players representing eight nations: Germany and Slovakia (six players each); Switzerland (four); Denmark (three); and Austria, France, Norway and Slovenia (one player each). These players were ecstatic to represent Europe, but some were also excited about the concept of giving their home country further exposure on a global stage for the hockey world to take notice. This was very important for players like Switzerland-born Nino Niedereitter. This tournament was also an opportunity of a lifetime for many players who got the chance to perform on the international stage for the first time. A lot of players are now ready to take their experiences from here in Toronto, as well as from their various training camp and pre-tournament locations, and lace up for the NHL regular season with their respective teams. “It was my first time against the greatest players in the world. Every shift was important, so I think it’s going to be huge for me,” said Team Russia and Detroit Red Wings defenceman Alexei Marchenko. The World Cup of Hockey 2016 looked to promote and grow the game of hockey, creating the ultimate global stage for hockey’s best to perform. As the tournament has come to an end, all of this and more was accomplished in Toronto. Hockey fans were treated to countless memories, a format that proved international tournaments can take on new forms, and – of course – the talented players that make it all possible.